With the winter setting in, you may be looking for some new slots to pass the long evenings with. Here at Winner Casino we have just launched some exciting new games that will help you do just that. They have themes that range from fairy tales to robots, and all of them are packed with exciting features that could see you land some huge winnings. 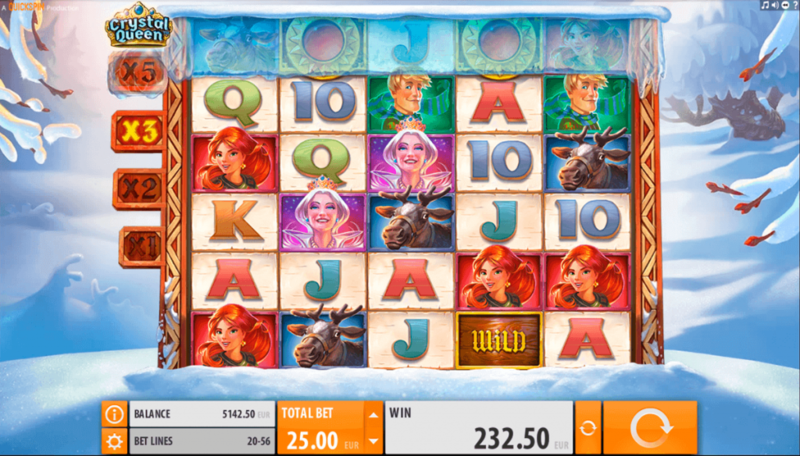 Winter is here and this new slot is sure to get you in the mood. It is based upon the Hans Christian Anderson story the Snow Queen and it is packed with features that will help you land some huge winnings. Crystal Queen is a 5 reel slot with 3 rows and 20 paylines. The reels are set against a snowy landscape dotted with trees while the top of the reels are iced over. There are four themed high value symbols, the Crystal Queen, a young woman, a young man, and a reindeer. The lower value symbols are the playing cards 10, J, Q, K and A. There are two wild symbols in the base game, a Regular Wild and Spreading Wild. They will both substitute for all of the other symbols, except for the scatter symbol, to help and form winning combinations. The scatter symbol is a red jewel in a gold setting. In the base game the regular wild symbol can only land on reels four and five, but in the free spins it can land on all reels except for the third. The spreading wild can land on reels one, two and three in the base game and two, three and four in the free spins. Whenever it lands on the reels it will spread out to up to five adjacent positions turning them wild. The main bonus feature is called Swooping Reels. When you start playing you will see that there are three extra rows at the top of the reels that are frozen. When you land a winning combination the symbols involved in it will disappear and allow more to fall into place, hopefully forming another win. With each consecutive win, one of the top rows of symbols is melted and increases the number of paylines available and the payout multiplier for any new wins, and this way it becomes easier to land wins. The first winning combination melts the forth row increasing the number of paylines to 32 and awards a 2x multiplier. The second winning combination melts the fifth row increasing the number of paylines to 44 and awards a 3x multiplier. The third winning combination will melt the sixth row increasing the number of paylines to 56 and awards a 5x multiplier. If you can land three or more of the red jewel scatter symbols anywhere on the reels you will win ten free spins. During the free spins, all of the rows are melted so you are playing with 56 paylines. Better still, during the free spins winning combinations can be formed from right to left as well as left to right, making it much easier to land wins. Crystal Queen has a betting range of £0.10 up to £0.20 per spin so it is not very expensive to play. The queen offers the top payout of 100x, the young woman can payout up to 80x, the young man can payout up to 60x, and the reindeer can payout up to 48x. If you want to enter into the winter spirit and see if the Snow Queen will grant you some huge payouts, then set the reels spinning on this exciting new slot today. If you are interested in robotics and you have thought about building your own robot then the new BigBot Crew is the game for you. It tells the story of a group of people who enjoy building futuristic robots designed to help you land big payouts. BigBot Crew is a 5 reel slot with 4 rows and 40 fixed paylines. The reels are set in front of a building where the robots are built and behind them you can see a street scene complete with buildings, trees and overhead wires. There are five high value symbols, the robot builders named Matsuo, Danielle and Joaquin, and two small robots. The lower value symbols are cogs coloured yellow, bronze, green and blue. The wild symbol is the BigBot robot. He can land on reels two, three and four in the base game and he will substitute for all of the other symbols, except for the scatter symbol, to help and form winning combinations. The wild symbol is four positions tall and can be nudged to cover all the positions on a particular reel. If you land at least two of the BigBot wild symbols completely covering all positions on two reels then the BigBot Respins are triggered. 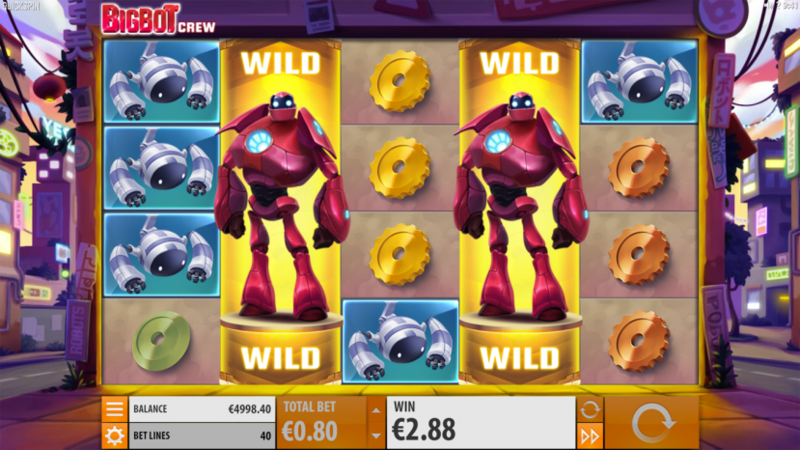 You will receive the same number of free respins as there are BigBot wilds on the reels. Any new BigBots that land will award an extra respin and all the wild symbols will appear in a new position on each spin. If you can land at least three of the blue scatter symbols anywhere on the reels then the free spins are triggered. At first you are awarded eight free spins. During the free spins the BigBot wild symbols can land on all five reels and if it lands covering an entire reel then you will be awarded an extra free spin. If the wild lands partially in view, it will be nudged to cover the entire reel, but it won’t award you an extra spin. BigBot Crew has a betting range of £0.20 up to £100 per spin so everyone should be able to enjoy it. The wild symbol offers the top payout of 400x. Matsuo can payout up to 300x, Danielle can payout up to 200x and Joaquin can payout up to 120x. The two smaller robot symbols can both payout up to 80x while the yellow and bronze cogs can payout up to 50x, and the green and blue cogs can payout up to 40x. If you want to see if the BigBot robot can help you land some huge wins then set the reels spinning on this exciting new slot today. If you dream of being part of a world of fast car races set in a beautiful Mediterranean location then the new The Wild Chase slot is the game for you. It will transport you into the heart of the action where there are some huge payouts waiting to be won. The Wild Chase is a 5 reel slot with 3 rows and 25 fixed paylines. Behind the reels is a view of a beautiful bay complete with mansions and boats floating on the calm waters. All of the symbols are linked to the theme. There are four characters, two men and two women, and a bag of diamonds, a car key, a watch, a ring, and a money clip. There is a big golden ‘X’ wild symbol. It can land on all the reels and will substitute for all of the other symbols, except for the scatter symbol, to help and form winning combinations. The scatter symbol is a vault door. If you land any winning combination on the reels then the Respin Feature begins. The symbols in the winning combination will freeze in place and you will receive one free spin. If more symbols add to the combination, or if additional wins land, then the process is repeated. Better still, if wild symbols form part of the combination then you will receive payout multipliers. One wild awards a 2x multiplier, two wilds award a 3x multiplier, three wilds award a 4x multiplier and four or more wilds award a 5x multiplier. If you can land three or more bonus symbols anywhere on the reels then the Free Spins begin. You will receive ten free spins during which there will be at least one multiplier wild symbol on each spin to help increase your winnings. 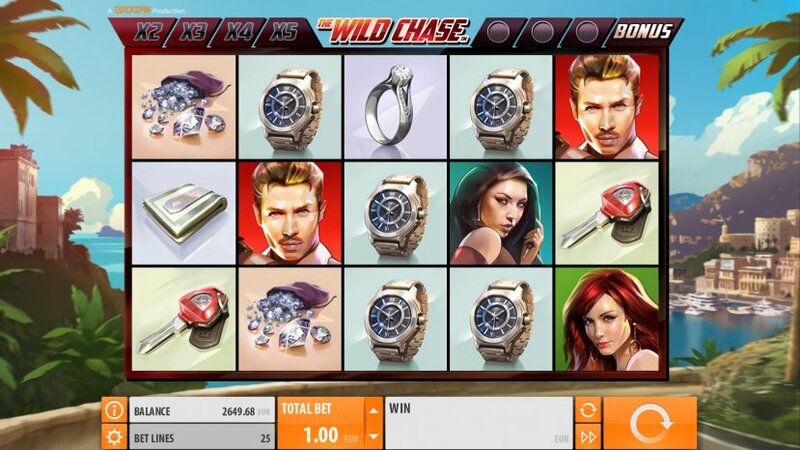 The Wild Chase has a betting range of £0.25 up to £100 per spin so it does not cost very much to play. There is a top payout of 50x available from the male character with a red background, the red-haired woman can payout up to 40x, the second woman can payout up to 30x, and the second man can also payout up to 30x. The bag of diamonds and the car key can both payout up to 24x, the watch and ring can both payout up to 20x, and the money clip can payout up to 15x. If you want to enter this action packed world and see if you can win enough to enjoy the lifestyle it represents, then set the reels spinning today and with a bit of luck you will soon start landing big wins.